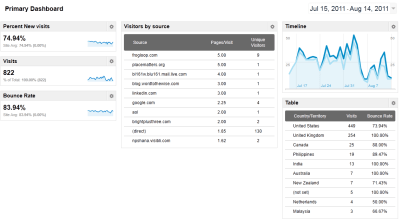 Google Analytics is free but getting actionable data from it takes a bit of planning and time. We wanted to highlight for you here some great resources and tips for using Google Analytics in your organization or business. see more visitors sharing links to your blog posts, videos and social media networks. New to Google Analytics or just want to get some insight personalized to your organization? Check out our free Analytics Assessment. Google Analytics can help you see if you’re achieving these tasks and meeting the goals you set for your online program. But you won’t find this data by just looking at just pageviews and visitor numbers. Here are a few tips and resources to help you measure what matters and make more data-driven decisions using Google Analytics. Google Analytics lets you customize your dashboard. You can also create multiple dashboards for different purposes and audiences. Keep dashboards clear and actionable. Analytics will create a standard dashboard report when you create an account. You will automatically see the last month’s worth of data for typical metrics such as visitors, pageviews per day, bounce rate and where visitors are from geographically. Customize the dashboard (you can even rename it) with metrics that could be more informative or inline with your goals. These could visits from various search engines, keywords used in google search or visitors by various platform (mobile devices, for example). When sharing the dashboard (or any data, really) be sure to include a short narrative that ties the data to goals, changes over time and context (how your site’s data compares with competitors and peer organizations). What good is website visitor data (or any data, really) if it doesn’t help you figure out if you’re meeting your goals? After all, we’re not putting precious resources into designing and building websites, adding content and redesigning just because someone said we should. We’re trying to get work done here. Visits to a key blog post or main blog page. It would be helpful, we think, to be able to quickly see how many times these goals are being met and if that is changing. Defining a goal means knowing the URL of the goal page and the value associated with the goal. For example, f you have an estimated value of an email address, use that as the value of meeting your email subscribe form thank you page goal. In the standard version of Analytics, goals are managed through a “goals” link in the left-hand navigation. In the new version of Analytics, goals are in the “Conversions” tab of the top navigation bar. Most nonprofits use third party vendors to host their advocacy and donation pages. Usually these are these vendors also host email lists and will be able to provide data on email delivery, click-through rates and conversions. Depending on the vendor you will be able to access or piece together reports that tie together the number of messages sent, messages opened, click-through rates (which may track to page views on your action/donation page) and number of actions/gifts as well as total amount given. visits from sources other than your email messages. You can also segment this traffic by source. user behavior on landing pages after donation or actions. A bounce on this thank-you page means that people aren’t visiting any other pages on your site. This may not be all bad but it would be good to keep people around. 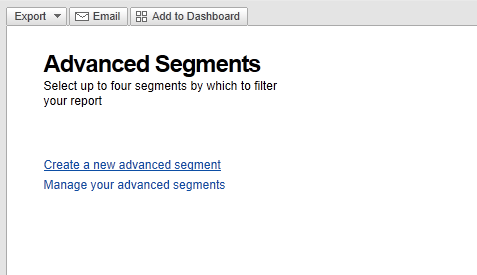 Advanced segments let you quickly see segments of traffic in various reports. There are numerous default segments such as all visits, new visitors and search traffic. But if you want to see only Facebook and/or other social network traffic in charts you can create and activate an advanced segment. To start creating an advanced segment choose "Create a new advanced segment" from the advanced segements menu. First, click the dropdown menu next to the “Advanced Segments” label near the upper right corner of the dashboard or whatever report you are currently viewing. That menu will show you all of the standard segments and any defined advanced segments. On the left side of the screen you will see a link called “Create a new advanced segment.” The image to the right shows this in the standard version of Analytics. In the new version of Analytics, Advanced Segments are called Custom Segments and are accessible via a dropdown menu in the top navigation bar. Build the values that you want to include or exclude from your segment. Click to see larger version. Next, define what you want to track. Start with a dimension (like source of visit) or metric (a value like number of visits). The easiest way to choose one is to type the word into the search button and let Analytics start narrowing the choices. Then choose a value that the metric should match. You can continue adding to the choices with AND (narrowing the search) or OR statements. If you want your segment to show all visits from facebook or twitter you would start typing “source” in the search box until the Source box came up. Choose it and then enter the value “Facebook” with the “matches exactly” condition. Give the segment a name and you can even test the segment before finishing. You can always return and edit the segment. Some set of visitors will always use site search to navigate the site. Generally, these visitors have a specific goal in mind: they’re tring to find a particular job listing, blog post or fact sheet. They know or at least think that it should be on the site. If site search is working well it’s just faster to use it than figure out site navigation. Search terms: Are people looking for content that you have? Are they looking for something different? If people are searching for content you don’t keep on your site it could mean that you should get that content on your site (or people think differently about your organization/site than you do). Exit rate: A site search exit means someone gets to the search results page and leaves the site without going further. In other words, they didn’t find what they were looking for on your site. A high site search exit rate means people aren’t finding what they came for – almost always a bad sign. This isn’t really a Google Analytics tip but registering your domain and a sitemap with Google’s Webmaster Tools will help your SEO and should give you better data over time. It takes a bit of technical setup to create and register an xml sitemap with Google but WordPress, Drupal and other blog and content management systems have modules or plugins that make this simpler. We will keep writing about Google Analytics, particularly about using it to track social media engagement and other ways to use it to track integrated communications programs. The resources below, though, are all helpful to Analytics users and teams of almost any level. Google Analytics for beginners: A great introductory post at mahalo.com for those just getting started and wanting to kick the tires a bit. Google Analytics IQ Lessons: This is a set of training videos that cover a wide range of topics in Analytics. They are prepared by Google and intended to help train users, consultants and trainers. You can get help here for everything from setting up goals and funnels to how filters work to how time on site is calculated. Google URL builder: Analytics will help you track and sort the link to your content that you put in emails, RSS feeds, blog posts, social media updates and other external locations. You can make this easier by using Google’s conventions of campaign source, medium and name. The Google URL builder will help you create these links. Avinash Kaushik’s blog, Occam’s Razor: Avinash Kaushik has quite literally written the book (or two) on Google Analytics. His blog covers a wide range of higher-level Analytics topics but is approachable even to newer Analytics users and folks who aren’t data nerds. This being the Internet and Google Analytics being a Google product, it should be no surprise that there are countless resources out there. If you have a question, Google it. Post to email lists and forums. Find a colleague in your organization or another group that is working with Analytics and support one another. Figure out who inside the organization can help you evangelize for data-driven decision making. Tell stories with the data (don’t just produce charts and tables). These are just a few of the tips and resources out there. Feel free to add more in the comments.